As of Oct 8, 2016, it looks like they have not yet updated their review policy. Language in emails and on website still asks for reviews, or at least suggests leaving a review. 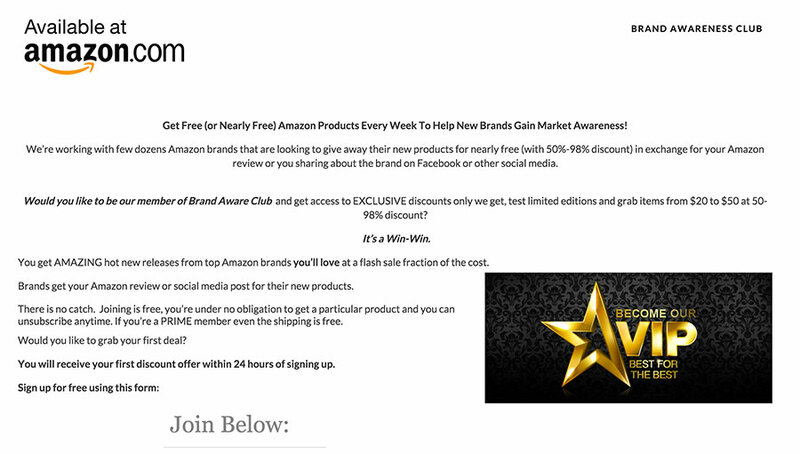 Their website uses two names: Brand Aware Club, and Brand Awareness Club. I just signed up with this site using only my email, and I received my first promotion within an hour! The site claims you will get one within 24 hours of signing up, so maybe mine is the exception, not the rule. My promotion was a bundle, meaning I had to buy two items to get the deal. Clicking the ‘buy now’ link took me to an Amazon page that already placed both items in my cart. It skipped the detail pages. They listed that only 48 pieces were available. Most review sites never tell you how many are available. The site is barebones, just a single page. I don’t see a log in area or dashboard, and the three emails I received right after signing up didn’t mention anything about having to log in. This looks to be doing everything via email, similar to the Giveaway Nation review site. There are four clear rules they stress on their site. All are pretty standard, as far review sites go, but one stood out: you can post “a review on Amazon or show the product on at least 1 social media site.” I don’t know of other reviews sites that let you choose to NOT post on Amazon. Seems like virtually all Sellers want the Amazon review. The address they have at the bottom of their emails is for a MailLink mail center at 848 N Rainbow Blvd, Las Vegas, Nevada 89107. I’m very skeptical about this site. Feeling rather dubious about this. Signed up today and the offer I received was not for an Amazon site but for another direct retailer website that sold branded, artsy office products (pens, paper, erasers). “BIG REQUEST: no rude or hostile reviews please – please stay professional (just like you would like to be treated). Please treat Brands we work with as your collaborators or family members: if there is something not right with their product let them know via Amazon message system so they can fix it & improve (instead of writing a bad public review). They will send you a fixed replacement or refund your purchase – just give them a chance before you publicly write them a not-so-good review. They stress that the 4-5 star reviews should be honest, but withholding the 1-3 star reviews is definitely dishonest. I don’t feel comfortable working this company. I completely agree. Thank you for sharing the information in the email; I have been hesitant to purchase any of their products because of the way they worded it on their site. Now that you’ve shared that additional info, I know it’s very clear they expect people to not leave 3 star reviews, and I will be unsubscribing from their mailing list. Like others have mentioned, I don’t feel good about this company either. They make it pretty clear that you are expected to leave a 4 or 5 star review. I had no problems with their warning against “3 star angry customer reviews”, because to me, if someone comes across as “angry” in a review, they aren’t doing their job properly as a reviewer anyway. But now that they’ve gone further and made it clear that 3 star reviews aren’t allowed even when they aren’t “angry”, that is just dishonest. If I get a product that is not defective, but is just not a good product, I should be able to leave a review to that effect. I highly recommend that you remove this site from your listing, as it is only contributing to the growing problem of people not trusting the reviews left by reviewers. I hear what you are saying, and really appreciate your d=feedback. While I do not agree with review sites telling reviewers what star-rating they can and cannot leave, I am choosing to leave this site up for now. I agree, the practice of quashing 3-star and below reviews is wrong. I am choosing to reach out to the owner of the site and see if I can work with him to get this rule changed. It’s still a valid review site, and I’d like to leave it up to the readers to decide to work with it or not. Hoping these comments color their choice in the matter, but hoping that they change their ways of the review site and understand this is not best practices. Thank you! 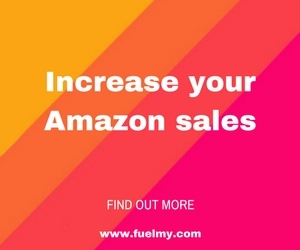 When I signed up, I immediately received an offer from them that directed me to another site that was not Amazon. It was an arts and supply store. I was told that I was to purchase something from there, I could get $4 off the item and that was my first “bargain”. The lowest priced item was $17.97. I’d call that a “bait and switch”. I got the first emailed ‘offer’ within seconds. And it’s bordering on con. Not illegal, just preying on gullible bargain hunters. You have to buy a bundle, and aren’t told how much it will cost until you buy. Instead, you’re told how much you ‘save’ by buying it. Haha. They “recommended” a non-Amazon site (zenzoi.com) and the available items shown were office supplies. The offer was $4.00 off per item. I didn’t have a good feeling about it.